Home Tags Posts tagged with "red shirts"
Thailand’s pro-government Red Shirt movement has warned that any attempt to oust PM Yingluck Shinawatra could trigger a civil war. 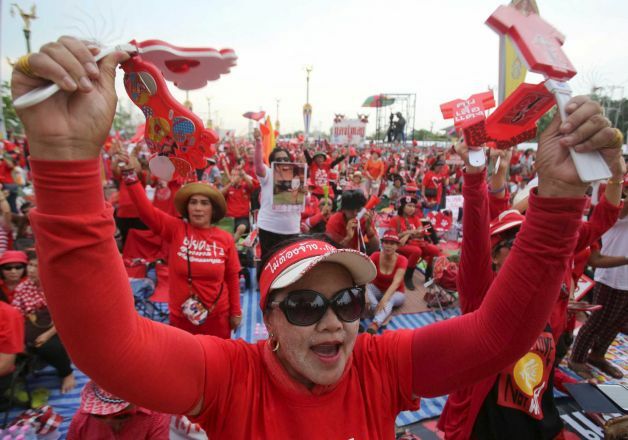 The movement’s leaders issued the warning at a rally outside Bangkok – the first staged by the Red Shirts near the capital since violent clashes broke out in November. Opponents of Yingluck Shinawatra and her party have filed legal cases against her. Months of anti-government mass protests have failed to unseat her. Speaking to a crowd of tens of thousands, Jatuporn Promphan, the chairman of the pro-government United Front for Democracy Against Dictatorship (UDD), said judicial institutions were trying “to take over power without elections”. “What we are most concerned about – that we want to warn all sides against – is a civil war, which we do not want to happen,” he said. Yingluck Shinawatra is facing mounting legal cases – including charges of neglect of duty and abuse of power – that correspondents say could see her removed from office in coming weeks. Meanwhile anti-government protesters have continued their own demonstrations from their headquarters in Bangkok’s central Lumpini Park. The government called an election in February, but that was obstructed by protesters. Since then Thailand has been in a state of paralysis. Yingluck Shinawatra’s party has won the last five elections, but her opponents argue that Thailand’s democracy is so deeply flawed that it must be reformed before another election can be held. Another factor driving the conflict is acute anxiety over the ailing health of King Bhumibol Adulyadej. The Red Shirts at Saturday’s rally openly showed support for his son Crown Prince Vajiralongkorn. He is the designated heir but some among traditional elite are believed to oppose him.